As smart phones get smarter, and app stores get larger, the conventional internet browser may find itself abandoned in favor of the thousands of mobile apps that people use every day. According to recent data, mobile apps are being used more often at the expense of browsing the internet. With the recent tsunami of mobile apps taking the world by storm, statistics are showing that people lean more towards using their phone apps rather than visiting the net on both their smart phones and on the PC. 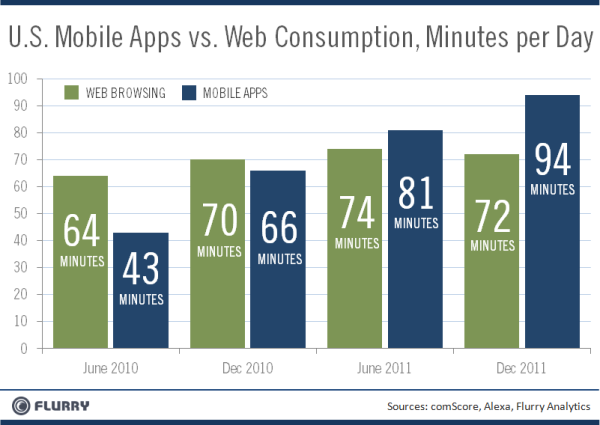 According to Flurry (blog.flurry.com), an analytics firm, mobile apps usage has steadily increased over time. Flurry originally noted this phenomenon in June of 2011, when their statistics showed that app usage was ahead in the race with browser consumption with users spending 81 minutes a day on apps compared to 74 minutes a day on the internet. For the original study, Flurry surveyed app usage in 140,000 apps running Flurry analytics and compared it to web data usage from comScore and Alexa. On Monday, Flurry updated this study by providing recent data that shows web consumption numbers remaining the same while time spent on apps continues to soar. Facebook may be one of the culprits of this shift, as users are leaning more towards accessing Facebook from their phones than from a browser, Flurry stated. Visitors to Facebook are streaming in from mobile apps. Flurry’s analysis shows that gaming and Facebooking combine to represent an astounding 80% of all time spent in mobile apps. So perhaps we shouldn’t count PC’s out of the lead just yet, but instead consider that consumers’ need to have access to News Feeds “now” and “on the go” (a need satisfied largely by Facebook) is truly the driver behind the wheel. The debate of native apps vs. HTML5 will continue for some time. In conclusion, Flurry also attributes the decline in web usage to users’ growing favor of native applications.